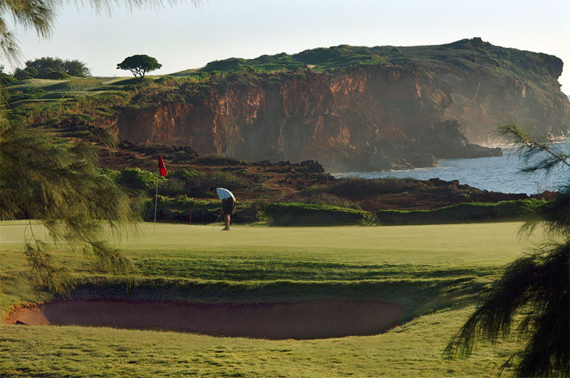 If ever there were a reason to visit Kauai, sensational golf opportunities would top the list. One of my all-time, most memorable golf shots transpired at Poipu Bay Golf Course. And not the kind of glory shot you may be thinking. This one earned me a penalty stroke yet lands on my list of unforgettables. Upon arriving to the course, I had already nearly maxed out my ball allowance for the trip. Fortunately, the club provided a sleeve of club-logo balls on the range (I was a happy camper). After loosing many balls to the course, I reached into my bag and pulled out my last ProV1 as we approached the ninth tee. On this 405-yard, par-4 hole, my tee shot flew to the right of the fairway (perhaps I was distracted by some of the most amazing Pacific views I’ve ever seen). While my foursome and I thought we had good site of it, upon reaching the area where it went out of bounds, there was no ball in sight. This area of the course was beautifully guarded by Hawaiian heiau, which are ancient places of worship. After scouring the area for a good five minutes, we were about to call it quits when a member of our group called us over to a lava-rock wall (a part of the heiau). There, perfectly perched atop the wall, was my ball. It was picture worthy and none of us ever really figured out how the ball could have come to rest where it did. Although I incurred a penalty stroke, there were certainly spiritual forces keeping my ball from rolling down the steep embankment opposite the wall. I played the rest of the round with the only ball I had left. Miraculous to say the least, especially considering my game. Recently, the Poipu Bay Golf Course announced their “Tee For Two” program, designed specifically for couples who want to enjoy an afternoon round on the course at a great value. Tee For Two allows couples to play an 18-hole round for just $125 (plus tax) per person–a substantial savings over Poipu Bay’s standard rate of $240. The special rate includes rental clubs (a $55 value per person), if needed, featuring the course’s brand new Callaway RAZR X clubs. Tee times for the program are offered daily from 1:00 to 1:50 p.m. only, and couples will be allowed to play the course as a twosome, based on availability. “We know that for many couples, one player is better than the other,” says Poipu Bay’s Director of Golf Craig Sasada, “and it can be intimidating for the novice player to be placed in a foursome with people they don’t know. For couples on the Tee For Two program, we will send them out as a twosome, if at all possible. We can’t guarantee it if the course is extremely busy that day, but if a twosome is possible, we’ll do it.” The Tee For Two special is offered now through the end of the year. 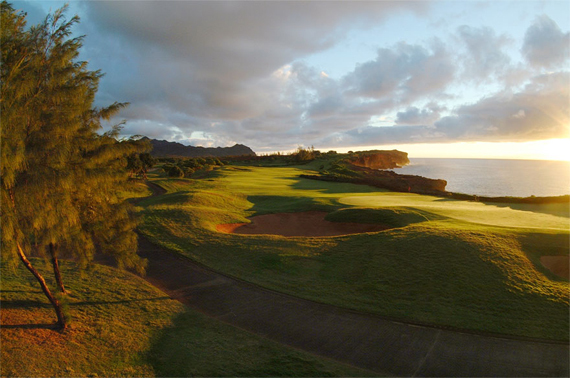 Poipu Bay Golf Course is situated on 210 oceanfront acres adjacent to the Grand Hyatt Kauai Resort & Spa on Kauai’s south shore. The spectacular course gained fame as the host course for the PGA Grand Slam of Golf from 1994 through 2006. A Robert Trent Jones, Jr. design, Poipu Bay has been consistently ranked over the years among the top 100 resort courses in the U.S.